Helllllllllo my friends! I just got back from the Young Living Convention in Grapevine, TX! Woohoo!! I am so pumped, but my brain feels like it will actually explode from all the information and education that was provided in those 4 days. So to help relieve the pressure, I decided to share some of that new knowledge with you! One of the lectures that I was most excited about was from Sabina DeVita, the author of Vibrational Cleaning Guide . 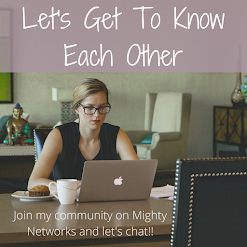 She is a brilliant and well educated woman who has dedicated her life to helping people reduce their chemical exposures in life. 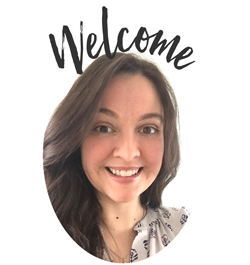 She's not only an international speaker and author, but also a holistic energy practitioner, registered nutritionist, environmentalist, and energy psychologist. How cool is that?! I think she's my new role model. Did you know that we often add antibiotics to the feed of animals to help "keep them healthy" so that they are cheaper and provide more revenue for farmers? That may sound like a great idea at first, but think about this-- do you remember the time when you called for antibiotics, but the doctor wouldn't prescribe them? Well, there is a reason for this! It's called the SUPER BUGS!! Sabina DeVita says that not only do 82% of E. Coli bacteria antibiotic resistant which live on ground raw turkey, but also 74% of the samonella bacteria on raw chicken were antibiotic resistant and 97% of all chicken products have traces of harmful bacteria. So what can we do about it? Wash our chickens? Nope, the CDC says that washing chickens is the worst thing we can do because of the water splash often spreads these super bugs around our homes. Whew! Now that we are done with all that scariness let's talk about something fun! Food preparation! I am a big believer in natural preparation of our foods. 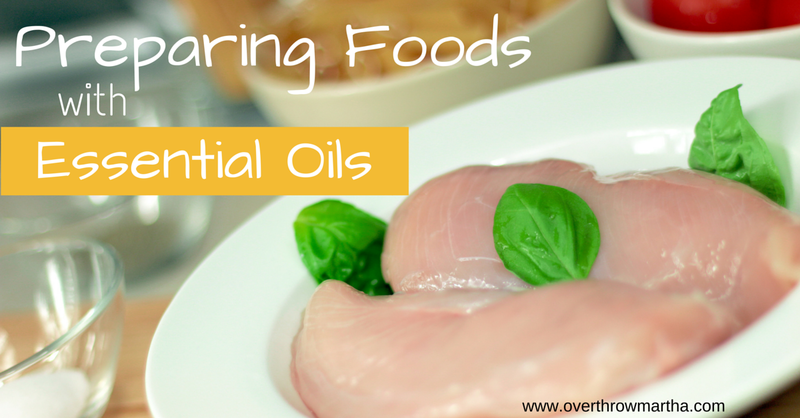 I have been using essential oils in many of my foods for quite a while! Lime in guacamole is delicious and I love to add basil to my tomato sauce, but there are ways to add essential oils to meats to help give them an added boost in flavor, but also aid in the preparation process. 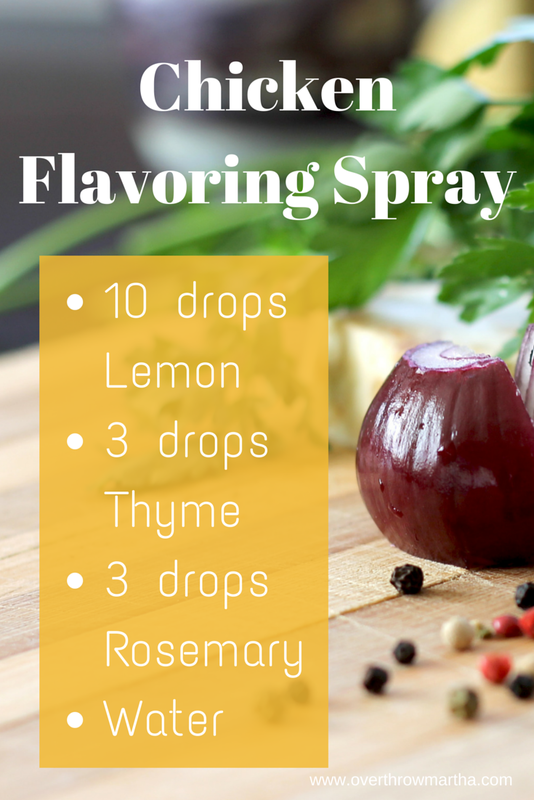 It's called the "Meat Flavoring Spray"
**Remember, you MUST only use essential oils labeled as "supplements" for your food products! ** Please do not use store bought essential oils which are perfume grade-- these are NOT safe for consumption! 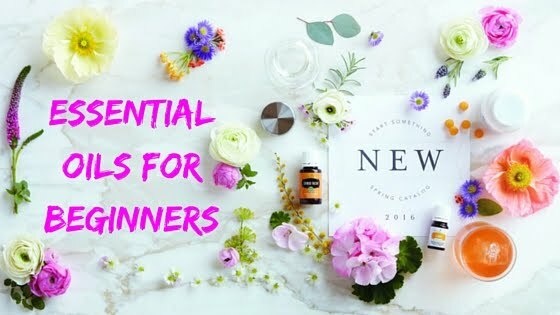 To find out how to get high quality supplement essential oils, read this. Feel free to swap out the oils in this recipe to add other spices to help suit your meal. Maybe a basil and lemon for Italian night or using cinnamon and ginger for an Asian flare! 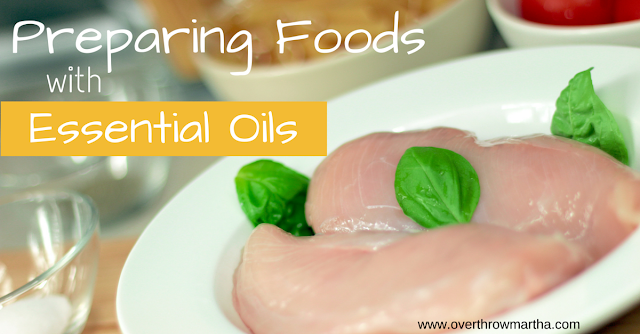 The flavors will be mild with the essential oils, but they do help in preparation of the meat. If you would like stronger flavors, just add more essential oil or lightly spray again after the meal has finished cooking. A little can go a long way! *Note: I am a vegetarian so all of these meat recipes were tested by individuals who are subject to my whims and desires. If you don't like the recipes, it's totally their fault. Veggies need to be washed too! 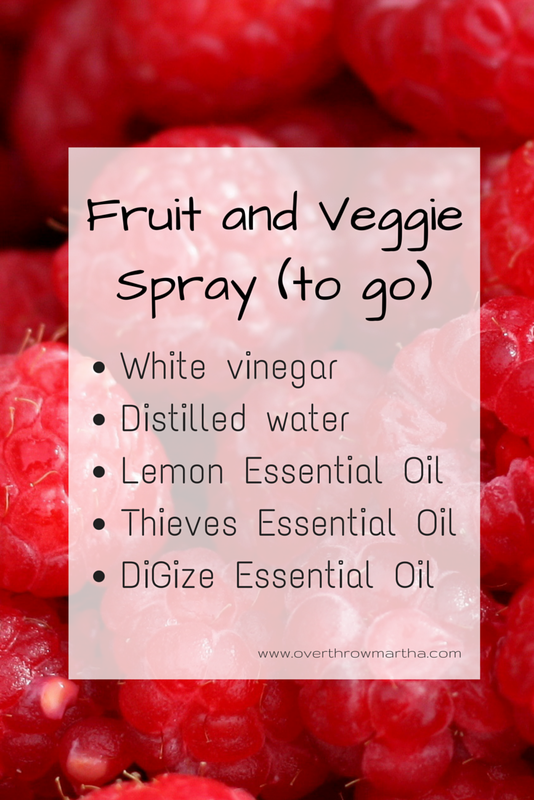 You can use essential oils as well to help keep them fresh and add an extra umph to just rinsing them off. Essential oils can help impart a nice flavor, break down wax and pesticide residual plus help to naturally preserve the produce for a longer shelf life. For instance, take a look at this yummy guacamole recipe! Add to a glass spray bottle and shake gently before use. Just spray your produce, rinse with water and pat dry before storing them in the fridge. You can also take this with you to work, traveling or eating out to help wash your veggies on the go. 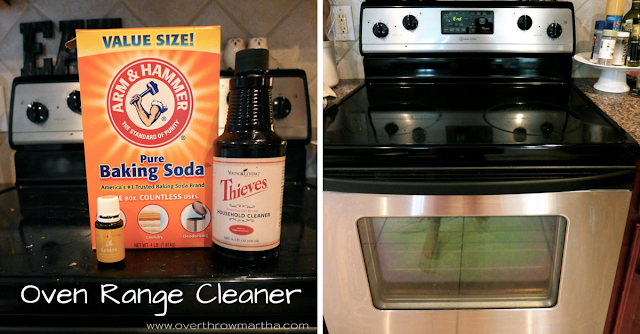 You can clean almost anything with the Thieves Household Cleaner. It's definitely one of my favorite products in the entire product catalog because you can make ONE cleaner and it will clean your entire kitchen safely and without harmful chemicals. Add the baking soda, lemon and thieves cleaner together and mix completely. Pour on top of range and spread over the range equally. Place a large wash towel (large enough to cover top of the range) over the baking soda mix. Let it sit for 10 minutes and then scrub with wash towel and remove most of the baking soda residual. Spray with window cleaner and wipe clean to remove baking soda residual. In a 2 oz glass bottle combine the ingredients and give a gentle shake before use. Spray everything including your cutting boards, counters, sink, oven, backsplash and more! Or you can try my DIY All Purpose Cleaner if you want to go all out with a DIY! Also don't forget about cleaning your dishes! Try my DIY dish soap, but if DIY isn't your thing than there is a brand new Thieves Dish Soap available for purchase, too! I'm so excited-- I ordered TWO to compare to my DIY dish soap. I'll keep you guys updated on how that goes! 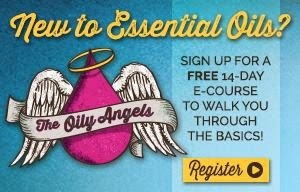 Remember you can get all of these products for 24% off by joining my oily awesomeness team! You get a lot of other perks too, so be sure to read up on it here! I can't wait to hear what you think about this post and recipes! MWAH! I became a vegetarian a few years ago. After seeing a documentary, Food Inc., and hearing about hormones in food that did it but antibiotics too? BLECH! !